MARQUETTE---Sophomore Leticia Antunes(Florianopolis, Brazil/Colegio Ofelia Fonseca) was named the Great Lakes Intercollegiate Athletic Conference North Player of the Week and helped guide the Northern Michigan University Volleyball team to four wins and a #23 ranking in the American Volleyball Coaches Association National Poll. Antunes led the Wildcats with 64 kills, hitting .340 percent in four matches during the Wildcat Open. She finished second on the team with 42 digs and four aces. 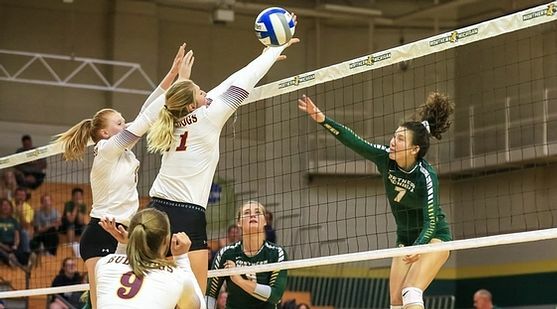 The sophomore outside hitter posted 11 kills, hitting .429, in the weekend's opener with the University of Minnesota Crookston then aided the NMU effort in an upset over the #1 ranked team in the country, University of Minnesota Duluth, with 21 kills and 10 digs. Saturday saw her tally 11 kills and 12 digs in a victory over Bemidji State University and 21 kills and 15 digs against St. Cloud State University. With the four victories NMU is now ranked #23 in the latest national poll, receiving 185 total points. The Wildcats return to action this weekend and open Great Lakes Intercollegiate Athletic Conference play by visiting Lake Superior State University Friday and Saginaw Valley State University Saturday.